Most people are introduced to orchids through phalaenopsis orchids—a good beginner's orchid. These are thick-leaved plants with elegant, arching sprays of blooms that can be seen in so many design magazines and sitting on coffee tables across America. Phalaenopsis are rewarding plants. They are not demanding and, in the right conditions, they will display showy blooms for months. Successful growth means finding the right balance between humidity, temperature, light, and air flow. Their long-lasting flowers are held on arching branches and open successively. A single multi-branching flower spike can have more than 20 flowers. Individual phalaenopsis flowers can last for weeks. Good light is required for phalaenopsis but absolutely no direct sunlight or the leaves will scorch. Rotate the plant from time to time to keep growth equal. Phalaenopsis can tolerate low light and will thrive in an east window, or a shaded southerly or westerly exposure. Also, they will do well under common grow lights positioned about a foot from the plant. A well-grown plant will have darker green leaves on top and streaks of red or burgundy on the undersides. Moth orchids grow on trees as epiphytes, which require host plants. They are different than other types of flowers and terrestrial orchids that grow in the ground. Instead of regular soil, they need potting material that mimics a host tree or comes from one like ground fir tree bark, redwood bark chips, or Monterey pine bark chips. Most bark potting media will work. Also, make sure there is some perlite, sphagnum moss, charcoal, or coconut husk chips mixed in to help with water retention. You can also buy a commercial potting mix that is made special for orchids. No matter the potting media you use, make sure there is plenty of air circulation for the rooting system. Epiphytes are accustomed to breezes and wind. Phalaenopsis is a monopodial orchid, which means that it grows from a single stem. It does not have the large water-storing pseudobulbs found on sympodial orchids, although its leaves can store some water. Thus, this plant has a lower tolerance for drought. During the growing season, water the plant whenever its exposed roots turn silvery white, usually weekly. Water these plants in the morning and try to keep the potting media slightly damp. During the flowering season, you can cut the water back to every other week. The higher the humidity, the more important it is to maintain a good air flow around the roots and leaves. Water should never be allowed to rest in the growing tip of the plant. This will cause the new leaves to rot, and the plant will die. Phalaenopsis are considered a warm houseplant. During active growth, they like temperatures between about 75 and 85 degrees Fahrenheit, but they can adapt to a normal house temperature of 65 to 70 degrees. The higher the temperature, the greater the plant's need for humidity. As with all orchids, the higher the humidity and temperature, the greater the need for turbulent air flow to prevent rot, fungus, and diseases. These plants also like a nice contrast between night and day temperatures. To induce a flower spike, the plant needs a few cooler nights, down to 55 degrees. The plants will not bloom well without this temperature contrast. During the growing season, fertilize with a weak orchid fertilizer weekly ("Weakly weekly," as the growers say). Cut fertilizer back to once a month during the winter and flowering season. Some growers like to give the plant a boost of blooming fertilizer in September or October to provoke a flower spike. They can also be grown in hanging baskets or mounted on slabs in a greenhouse-type environment. As with all epiphytic (grows on the surface) orchids, they should be planted in free-draining containers. Orchids are propagated by seed, but it can be time-consuming. Periodically, the plant will naturally produce "baby" orchids known as a keiki. These are identical copies of the parent and normally appear on either an old or new flower spike. After the keiki is about a year old, you can remove it from the parent plant and give it its own pot. The keiki is ready after it has two or three leaves and its own roots (about 3 inches long). Phalaenopsis can be grown in most orchid potting media. Repot phalaenopsis in spring, after the bloom is done. Adult phalaenopsis can often go for two years or more before they need to be repotted. There are about 60 true species of phalaenopsis. 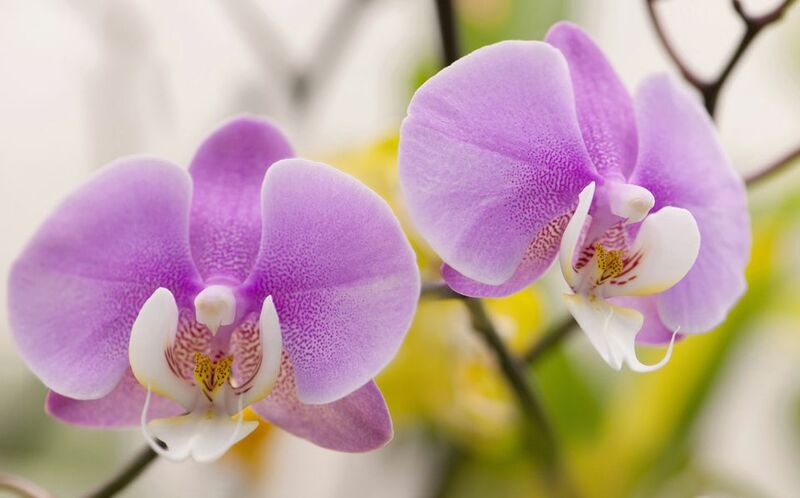 These plants have been extensively hybridized, and there are thousands of phalaenopsis hybrids, ranging from the stark, classic white hybrid moth orchid to jewel-like miniatures with clouds of yellow and candy pink blooms.